... Though I aspire to more inspirational work, I will admit to finding the litterbox cake post a perfect illustration of the Dolittler vision: engage, instruct, influence. And the cake may be gross, but it's my way of saying: "Move over, boys. This is not Dr. Dolittle's profession any longer!" 11. present to oohs and aahs and ughs all around — then dig in! 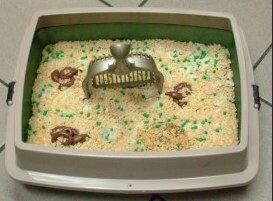 Title pic: Dr. K's infamous litterbox cake!